2 X LED DRL with grill surround. LED Qty: 5 Ultra Bright LED. Model Number: for 2009 Ford focus Sedan. Remark: 10 LED lamp set of 2 pieces. 1 X Yellow lint to park lamp connector. Intensity: high intensity 900 cd Light Source. 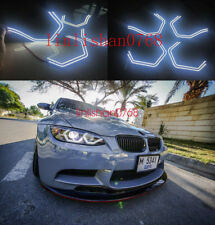 For BMW 3 Series E90 E92 E93 Coupe and cabriolet 2007-2013 Excellent DTM M4 Style Ultra bright led Angel Eyes kit. 2007-2013 E90 E92 E93 3 Series Coupe and cabriolet. E92 : 07-10. E90 : 07-10. 4 pcs led Angel Eyes Rings. SAE and E-Mark (E4) Stamped on the lamp. EU certification E4. 2 X LED DRL with grill surround. Protection Features: Reverse Polarity Protection, Open Circuit Protection. Storage Temperature: -50 ~ 80 degress. 2 X LED DRL with grill surround. Remove the original car's fog lights first and then install this fog lights, the plug can be directly inserted into the plug on the original car! Light Source:LED. Item Type:LED Lighting. Material Type:PC and CCFL. Light source:CCFL. 6 pcs CCFL Rings. Item Type:Angel Eyes. New lights for the headlights, "" Angel Eyes "," which will be visible even when the xenon. The temperature of the light flux 7000 to provide bright lighting and eye-catching look of your car. FOR:M3 M5 F30 E90 E92. DESIGN Based on BMW M4 Iconic Lighting Concept ! 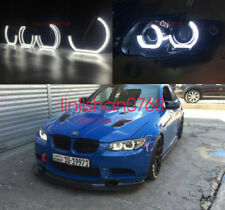 CONCEPT ICONIC LED Kit for BMW Headlights. YOUR HEADLIGHTS & RESEMBLE THE LOOK OF THE BMW CONCEPT ICONIC LEDS. 4.Built-in fuse assures a high degree of safety. For BMW 3 Series E90 E92 E93 2007 2008 2009 2010 2011 2012 2013 and cabriolet Excellent DTM M Style Ultra bright led Angel Eyes kit. 4 pcs led Angel Eyes Rings. 360 degree brightness design. The following For BMW listed below. For SUZUKI baleno 2016-2017. Remove the original car's fog lights first and then install this fog lights, the plug can be directly inserted into the plug on the original car. Protection Features: Reverse Polarity Protection, Open Circuit Protection. 2 X LED DRL with grill surround. Remark: 12 LED lamp set of 2 pieces. Light Source Material Type Item Type Intensity: high intensity 900 cd Light Source. United Kingdom. Remove the original car's fog lights first and then install this fog lights, the plug can be directly inserted into the plug on the original car! For BMW 5 SERIES E60 E61 545I 530i 528i 535I XI M5 2008 2009 2010 and cabriolet Excellent DTM M4 Style Ultra bright led Angel Eyes kit. 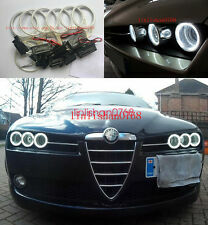 4 pcs led Angel Eyes Rings. The following For BMW listed below. For Mitsubishi outlander 2015-17. Remove the original car's fog lights first and then install this fog lights, the plug can be directly inserted into the plug on the original car. Protection Features: Reverse Polarity Protection, Open Circuit Protection. 2 X LED DRL with grill surround. Protection Features: Reverse Polarity Protection, Open Circuit Protection. Remove the original car's fog lights first and then install this fog lights, the plug can be directly inserted into the plug on the original car! For LEXUS IS200 IS300 (1998-2005). - Super bright CCFL illumination lights "Angel Eyes". 4 pcs CCFL Rings. New lights for the headlights, " Angel Eyes ",which will be visible even when the xenon. The temperature of the light flux 7000 to provide bright lighting and eye-catching look of your car. Replacing the fog lamp bezel covers or the lower bumper grille inserts. 6000K Xenon white color. You can find this newer fiber optics design on many cars such 2013 Audi A4, A5 and R8 and 2013 BMW 3, 5, X5 Series. For ford fiesta facelift 2005 2006 2007 2008. - Super bright SMD LED illumination lights "Angel Eyes". 6x brighter than conventional CCFL halo rings. 4 pieces LED Rings, in total 5050 SMD LED lights. New lights for the headlights, " Angel Eyes ",which will be visible even when the xenon. There are 2 pcs of front door sill in one set. this price is only for 2 pcs of front door sill, no rear door sill produced now. Fit for Honda HR-V 2014-2016. Fit for Honda HR-V 2014-2016. We greatly value your opinion and suggestion, and will make every effort to improve and impress your loyalty. For Mazda RX8 Rx-8 2004 2005 2006 2007 2008. Made with high quality 3-Emitter 5050 RGB SMD LED lights. -2 x RGB multicolor rings, based on your vehicle. Brightness (8 in All). Brightness- (8 in All). 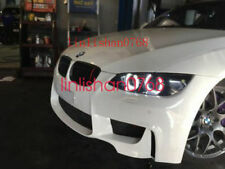 Fit for BMW F30 F35 2013-2015. Fit for BMW F30 F35 2013-2015. There are 2 pcs of front door sill in one set. this price is only for 2 pcs of front door sill, no rear door sill produced now. 100% new, 100% waterproof. Item Type:LED Lighting. Light Source:LED. Remove the original car's fog lights first and then install this fog lights, the plug can be directly inserted into the plug on the original car! Color Temperature Range: 6000-6700K. When you open the door, you’ll see a LED light projection welcoming you which emanates charmingly. Super Bright LED and SMD Technology. Low Temperature and Power Consumption Saving. No need for drilling, cutting or modification. Contents 1 Set - 2pcs (Right Light). 2 X LED DRL with grill surround. Remove the original car's fog lights first and then install this fog lights, the plug can be directly inserted into the plug on the original car! Remark: 12 LED lamp set of 2 pieces. Mitsubishi ASX Outlander 13 . LED Lighting. Protection Features: Reverse Polarity Protection, Open Circuit Protection. Light Source Color Temperature Range: 6200K-6500K. Current Stability: less than 2ma (24 hours). ForVolkswagen VW Passat B5.5 3BG 2001 2002 2003 2004 2005 Sedan. - Super bright CCFL illumination lights "Angel Eyes". 4 pcs CCFL Rings. New lights for the headlights, " Angel Eyes ",which will be visible even when the xenon. Car Model: BMW X1 E84 Non-projector 2010-2011. Car Make:for BMW X1 E84 Non-projector 2010-2011. Compatible for model: For BMW X1 E84 Non-projector 2010-2011 Halo Ring. Material Type:PC and CCFL. Light source:CCFL. For LEXUS IS200 IS300 (1998-2005). - Super bright CCFL illumination lights "Angel Eyes". 4 pcs CCFL Rings. New lights for the headlights, " Angel Eyes ",which will be visible even when the xenon. The temperature of the light flux to provide bright lighting and eye-catching look of your car. FOR:Ford Mondeo 2002-2005. 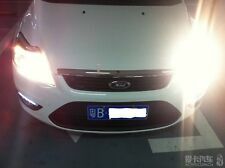 - Super bright SMD LED illumination lights "Angel Eyes". 6x brighter than conventional CCFL halo rings. 4 pieces LED Rings, in total 5050 SMD LED lights. New lights for the headlights, " Angel Eyes ",which will be visible even when the xenon. Model Number: for Hyundai IX35. 2 X LED DRL with grill surround. LED Qty: 8 Ultra Bright LED. Remark: 16 LED lamp set of 2 pieces. Car Maker Light Source 1 X Yellow lint to park lamp connector. Intensity: high intensity 900 cd Light Source. Car Make: Benz 2006-2009 X164 GL320 350 420 450 550. Light Source:LED. Item Type:LED Lighting. 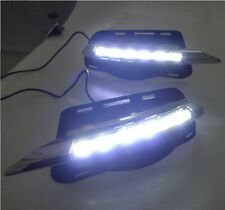 Light Source Material Type Item Type 2 X LED DRL with grill surround. United Kingdom. (2004-2007) E87. (2000-2007)E39, E60/E61. 700 Series - 745LI, 745I, 745, 750, 760, 760I, 760LI, V12. These are the bright,red high power BMW Angel Eye LED marker kits available, utilizing high power LED chip. 2 X LED DRL with grill surround. Model Number: for Toyota FJ CRUISER 2007-2014. Remove the original car's fog lights first and then install this fog lights, the plug can be directly inserted into the plug on the original car! Made with high quality 3-Emitter 5050 RGB SMD LED lights. -4 x RGB multicolor rings, based on your vehicle. For Toyota Camry 2002 2003 2004 Le Xle Altise. Brightness (8 in All). Brightness- (8 in All). Car Model:Chevrolet Lacetti Optra Nubira 2002- 2008. Car Make:forChevrolet Lacetti Optra Nubira 2002- 2008. Compatible for model:Chevrolet Lacetti Optra Nubira 2002- 2008. Material Type:PC and CCFL. Light source:CCFL. When you open the door, you’ll see a LED light projection welcoming you which emanates charmingly. Super Bright LED and SMD Technology. Low Temperature and Power Consumption Saving. Car Make: Benz 2006-09 X164 GL320 350 420 450 550. Light Source:LED. Item Type:LED Lighting. 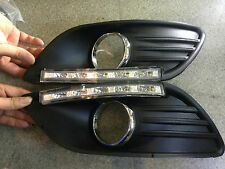 Light Source Material Type Item Type 2 X LED DRL with grill surround. United Kingdom.